We carry a reasonable amount of Recovery and Maintenance Gear in/on our Oka, nearly all of which we have used at some stage, often to assist other travellers. However it is too easy to go overboard on recovery gear, most of which you hope you'll never need. Some weight/space compromises will inevitably need to be made, ie non-critical domestic items used everyday, vs rarely used but essential recovery gear and tools. 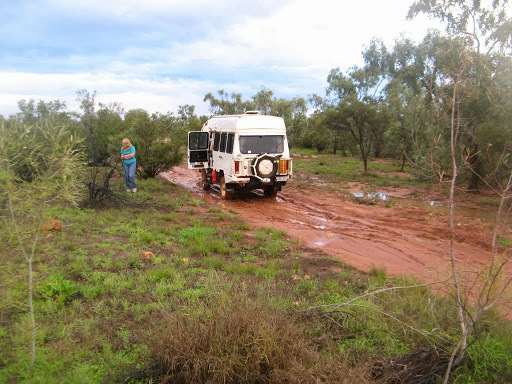 See this useful article on recovery gear from 4WD Overlander and this Survival Guide which includes vehicle recovery advice. We also have a separate article on our Safety and Emergency Equipment. ◦ Plus a thick 300x300 mm plywood base plate. (You could buy a proper Hi Lift base plate for around $44, but a very thick piece of plywood is more useful and economic. To stop it sliding, drive in a few Tek Screws to match the holes in the foot, or screw some strips on the top and bottom). ◦ We have also fitted extra high lift jacking points (cut outs) to the outside of our bullbars. ◦ A Hi-Lift jack can also be used as a winch for short distances. ◦ An overhaul/repair kit for the Hi-Lift jack is worthwhile, in case you break something (like the shear pin). Note, in the event of wear on the heavily used section of the centre climbing bar, it can be reversed while renovating the jack. Hi Lift Jack bolted across the front bull-bar for quick access. It has a centre support as well to reduce whipping on corrugations. ◦ Plus 4 inch hard wood timber block, to ensure adequate lift height can be achieved. Most hydraulic jacks (except double acting versions) have only a limited lift height. ◦ Many jacks only have a small round flat tip (saddle) which can be very dangerous under a curved, dirty surface. Ensure your jack has a broad cupped tip or saddle so that it can't slip off round axle cases. You could easily weld something up. ◦ If you can't get the jack under the vehicle, dig out hole for its base. This can be a risky arrangement but the wheels are well chocked. The owners had no other options in this case and fixed their wheel problem safely. The tyre came off the wheel and went bush. • Note: always use 2 means of support or jam a spare wheel (or similar robust object) under the vehicle (such as the diff) for protection before jacking or getting underneath. Hydraulic jacks can slowly lower themselves without notice. • The Screw Jack and Axle Stands are mounted in a frame under the rear right hand bullbar. Accessibility is not that good but they are maintenance rather than critical recovery items. • This allows a wheel to be lifted directly using the Hi-Lift jack without the need to get under the vehicle. A wheel lift strap (eg a Hi-Lift Lift-Mate might) also be useful if you have spoked wheels. Hub Adaptor for raising wheels directly using a high lift jack. You'll probably need to dig out a flat area for the base plate. • These can be used for lifting a buried or submerged wheel, or if hung up on rocks. After it's lifted, branches, sand mats or other supporting material can be packed beneath the wheel, or a jack/axle stand inserted under the axle to enable the wheel to be removed. • Use with care on the front hubs since they are a smaller diameter and have thinner walls than the rear hubs. Make sure they fit snugly, with a ring adaptor, you don't want a broken hub as well. At a pinch, a strap could be used around the hub instead, but would not be as secure. Maybe a tree trunk protector would work. • For use as a tow rope and for removing obstructions from tracks (even though we don't have a winch, straps are much lighter than chains). • Also useful for strapping an axle to the chassis after suspension failures, we know. • Tow points are fitted to the front and rear bullbars. • Equalising strap allows both tow points to share the load. 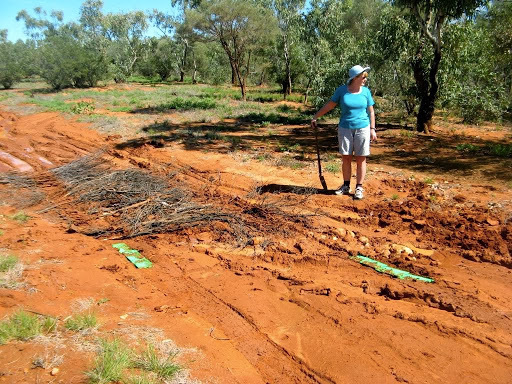 • For recovering bogged vehicles, also useful for extending the winch strap although they do stretch of course. • When joining 2 straps or ropes, always insert something solid (eg branch or hammer handle or rolled up magazine) between the loops so they can be undone more easily. Rope can cut through itself in a tight knot. • Never allow anyone near a strap, rope or chain under tension in case something gives way, and put a towel or blanket over the strap so it can be seen. 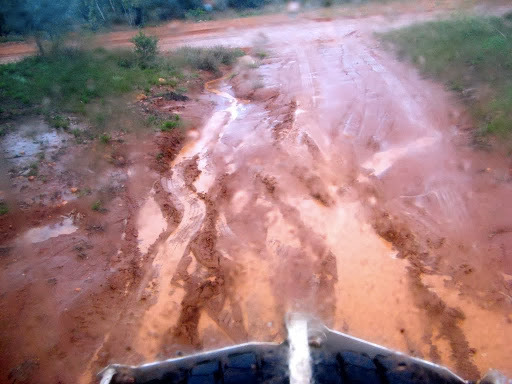 • When pulling obstructions off tracks or towing other people out of boggings, we usually do it in reverse so we can watch what’s happening and/or signal to them (hand-held CB radios are useful here too). People have a habit of leaving their hand brakes on while you are trying to tow them out, but why, when they are bogged anyway? 6) Spades, long and short handled. Small plastic sand mats after a successful extraction in a sticky situation. They were bought for a smaller, earlier 4WD and really need to be larger for the Oka, but they still worked fine. 7) Sand Mats x 2. • These can be any 300 mm x 1 m sheets of 12mm timber, tough plastic (shop bought) or expanded metal, preferably with a rough surface. • Good locally made ones (around $250-300/pair) are available here and here and cheaper ones are also available here. But I think you could make some economically out of expanded metal sheeting (as used for security doors). • I've also seen milk crates cut up and linked together to do the same thing. See here for some more ideas. 8) Air Compressor, air lines and gauge. 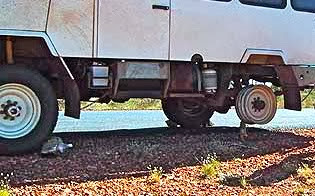 • We raise and lower our tyre pressures quite regularly on outback treks. • Take a spare valve connection as they can fail. • We can then also connect 2 tyres together to share air pressure if the compressor won't compress. Keep the pressure in a spare tyre higher than normal (60 to 80 psi) for this purpose. • To warn others of your predicament, to protect yourself and thus avoid making things worse. • A sand flag and pole (or any tree branch) can be used for this purpose. • This might seem a strange item in a list of recovery gear but communications can assist with information, advice or actual help, which might well be closer than you think. • A Satphone might prove a useful alternative, a CB radio less so. This includes the essential tools and safety equipment (glasses, gloves) for use of the above recovery gear. We also carry the spare parts (usually only one of each type) and the tools necessary to repair or replace items which directly affect the three key areas of mobility, safety or reliability. 3. Reliability: electrical parts (starter and alternator brushes, lamps, fuses and wire), lubricants, filters, oil seals (rear hub mostly since they run in diff oil), belts, cable plus small u-bolt clamps (to repair clutch, throttle, park brake cables). Tools used in the workshop to make repairs are pretty much the tools you'd need on the side of the road too, particularly any vehicle specific tools. Other travellers will usually have standard tool kits but few would have a 2 1/2 inch box spanner for hub spindle nuts, for example. 8. Bits of metal or rubber found on the side of the road. (It's quite surprising what useful material can be found discarded, or more likely fallen off something, on the roadside). 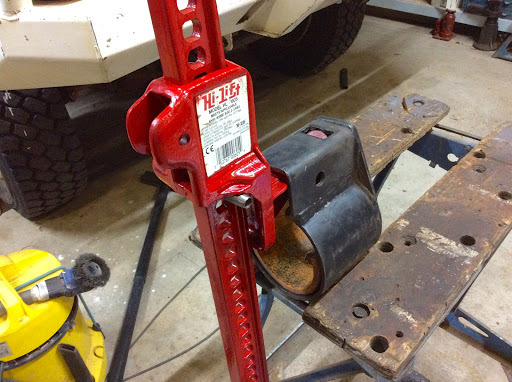 • For an Oka or other high clearance vehicle, a standard 48 inch high lift jack is inadequate as it can't lift wheels clear of the ground before running out of height (unless using a Hub Adaptor or Wheel Lift Strap). You'll need the 60 inch version to do any serious repairs to the springs or suspension pins. See here for a useful article. • You can chain the axle to the chassis so as you lift the body, you also lift the axle/wheel at the same time. You get quicker wheel lift but at the expense of a much higher load on the jack. My preference is to lift the body a bit with the hi-lift jack, then lift the axle/wheel with a bottle/screw jack and then repeat the process until sufficient wheel height is gained. It’s easier and safer than relying on a single jack, especially if the vehicle is leaning with one wheel deep in a hole. • I wouldn't even consider an Exhaust Jack (the blow up balloon type jack). They may appear tempting, since they appear to be light and easy to use (but not cheap), but they are unstable, unsafe and require a flat surface on the bottom of the vehicle, which most don't have, especially an Oka. Plus they need smooth flat ground and isn't it always just like that when you need to jack up the vehicle? • Air powered hydraulic jacks or those with a solid base and top (eg Selson airbag jacks, used to jack up trucks and busses) are probably OK.
A safe way to jack your vehicle? • Ensure critical recovery gear is accessible from inside your vehicle as well as outside. In the event of a bogging or partial roll over, external access might be impossible, eg if a high lift jack or spade is carried under the rear or in a compartment blocked off or behind a stuck door. We've seen it done, we had to recover a ute that slid into a drain on the Bloomfield Track, his spade was trapped under the ute. • It might seem blindingly obvious, but ensure that all your recovery gear actually works before leaving home. We've met people whose jacks aren't high enough (or low enough to get under a vehicle with a flat tyre), whose spare wheels don't fit, without adequate jacking or towing points, or who simply don't know how to use their (newly bought ARB/TJM) equipment. 5) Winching? We don't have a winch. • They are heavy to carry around and on the few occasions we've been stuck there was no suitable anchor point available anyway. Winches also generally only pull in a horizontal plane, which is handy for pulling other people out, but often you'll need a vertical lift, hence our Hi Lift jack. • If you do have a winch, you'll also need good batteries (unless it's a PTO model), a pulley block, tree trunk protector, a cable dampener and possibly a ground anchor and cable extender. These all take up more weight and space and have really only one function, which hopefully will seldom be used. See here for an interesting discussion on the pros and cons of fitting a winch. 6) Rules for avoiding trouble. • Rule # 1, don't go anywhere or get into anything that you might not get out of. ⁃ for help to arrive as it surely will, however embarrassing that might be and however long it takes. ⁃ Don't unnecessarily break your back, or worse. You're on vacation, there's no rush. ⁃ It may be a challenge but it's probably not a disaster. 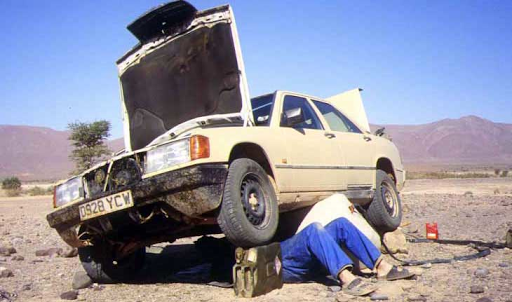 • Manuals (and/or files on your computer), and information on how to recover a vehicle, can provide a range of alternative ideas on solving a recovery problem. Don't forget the ideas of other members of your party or other well meaning travellers who will no doubt stop to assist but don't be pushed into something until you've considered all possibilities. • In the 9 years we've been touring with our Oka (plus many years of 4WDriving before that), our learned response to a crisis is to do nothing, at least initially (unless there is an urgent medical/safety situation), until we have consider all the options (and yes, spouses are often a useful source of alternate ideas). • In the meantime, we erect some warning devices (flags, milk crates, branches or similar placed 50m either side of the stranded vehicle) and get on the HF radio to get some advice or report the dilemma, it's free and anonymous. • Rushing into something might make a bad situation worse, and the next morning things often don't seem quite so bad, tracks have dried out, or help has arrived or a brilliant solution has come to mind overnight. Even if they don't, you'll be rested (unless you're stuck at 45º) and better able to tackle the problem. After a sudden downpour, too slippery to move... ..... and the next morning, mostly dried up. • These might prove useful in urban environments or even on major highways, but on remote tracks it will prove ineffective. Even if you can contact them, it might take days to get a tow truck out your way (if at all) and towing is all they will do, they don't carry adequate spares to fix any vehicle and the extra costs might be prohibitive anyway. 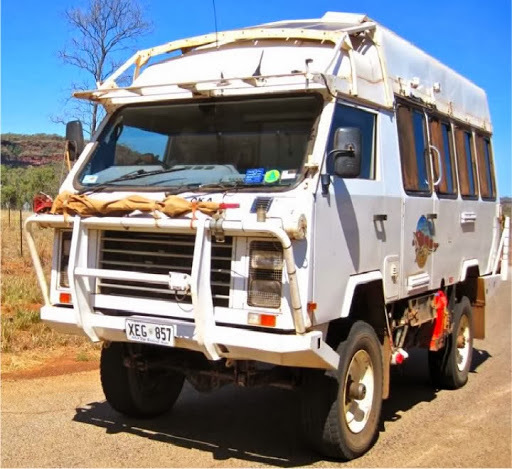 • Last year we helped a stranded motorist near Eromanga on the Tibooburra track, a Commodore(!) with 2 shredded tyres, a soft spare and no compressor. We contacted the RACQ who eventually sent a tow truck 240 km from Thargominda but it took several days to arrange and even then they would only tow him back the way he came. • In 2008, a Discovery was stuck on the CSR for 3 weeks with an engine management problem. 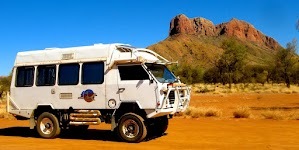 Tow trucks sent from Halls Creek by the RAC WA tried, but couldn't reach them and eventually they were towed out very laboriously over hundreds of sand dunes by another very kind traveller who put his own vehicle at risk. • Much better to be self-sufficient, and luckily you can be in an Oka.